So dumb. This is another liberal agenda item. One of the more prominent Parkland student activists — best known for his work pushing for stricter gun control laws — is branching out into other areas of progressive agitation. Cameron Kasky wants to help women get better access to tampons. Last week, Kasky and others, now mandated to carry clear plastic backpacks so that school administrators can see what students are carrying with them to class, protested the “violation of their right to privacy” by stuffing the bags with price tags, stickers, and slogans written on pieces of printer paper. 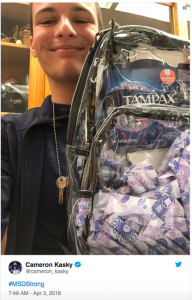 Kasky decided to stuff his with tampons, because the clear plastic bags make it impossible for women to put their feminine hygiene products in small carrying cases, thus exposing them to ridicule. The clear plastic bags are normal fare for retail workers, and inner city students are used to much stricter security measures (for example, at some schools in Chicago students are subjected to random bag searches and pat downs and must pass through metal detectors), but they make school “feel like a prison” for some Parkland students.